JULIUS W. HOBSON, SR., along with Josephine Butler, founded the D.C. Statehood Party in 1969 “to redress the inequity that Washington residents were not able (and still are unable) to exercise their full rights as citizens because they live in the federal district controlled by the U.S. Congress that does not have voting representation in Congress. The multiracial committee concluded that the District of Columbia should become a state. Rev. Jesse Anderson, Rev. Doug Moore, and Chuck Stone, then editor of the Afro-American, first proposed statehood for DC in a March 1969 news conference” [although Thomas Jefferson had made a similar proposal when he was the appointed Mayor in 1800]. A year later, Julius Hobson adopted the idea as the central theme in his campaign for a non-voting delegate to the U.S. House of Representatives, and the DC Statehood Party was launched. Julius Hobson (1922-1977) was a leader and fighter for justice long before the founding of the Statehood Party. The Washington Post in its obituary of him described Hobson as a maverick, an egomaniac, a gadfly, a hero who spent his adult life waging an unorthodox and often lonely war on the racism that had shaped his childhood, using the tools of publicity, statistics, the American legal system and an implacable refusal to let things lie. “I sleep mad” Hobson used to say. Born in Birmingham, Alabama, he graduated from Tuskegee Institute. After serving a stint in the army during World War II (1938-1945) where he flew missions and was decorated, he moved to Washington. From 1961 to 1964 he served as president of the Congress of Racial Equality. Between 1960 and 1964 he led more than 80 picket lines in front of approximately 120 downtown retail stores, resulting in employment for some 5,000 African-Americans. He initiated a campaign that resulted in the first hiring of black bus drivers by DC Transit, forerunner to Metrobus. Hobson and CORE forces the hiring of the first black auto salesmen and dairy employees in the city. He directed campaigns against housing discrimination, protesting at private apartment buildings and in front of the District Building. He conducted a “lie-in” at Washington Hospital Center, which led to a jail term but helped end segregation in hospitals. He campaigned for attention to a growing rat problem by taking a cage of rats on top of his car to Georgetown in response to the city claiming it could not manage the problem, and after threatening to release the rodents in that tony section of town the city found the means to take it seriously. 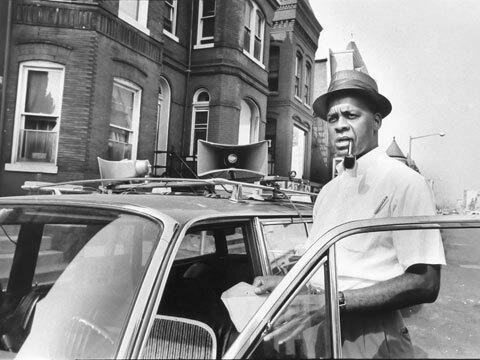 In 1967, after a very long court battle that left him deeply in debt, he won a lawsuit that outlawed the existing rigid track system, teacher segregation, and unfair distribution of books and supplies in DC Public Schools. In 1970 he was elected as a member of the DC Board of Education in the first such election for any public office in DC history. It was Hobson’s campaign for the 1971 congressional non-voting delegate seat as a Statehood Party candidate that propelled the Statehood Party into broader awareness and created a viable third party in the city, although he lost to Walter Fauntroy. In 1974 Hobson was elected to the City Council on the Statehood ticket, a seat he held until his untimely death from cancer in 1977.